With choice comes the requirement of making a decision, right? I went recently to a friend's place in New York City, perhaps the most happening city on earth. The big problem on the holiday was simple. "What do we do today" was always answered with option after option and eventually we'd have spent half the day indoors trying to decide what to do next. The word 'or' was used a lot. And now we motorcycle enthusiasts are finally coming up to that situation. Which is an absolutely great thing! But deciding can be hard. 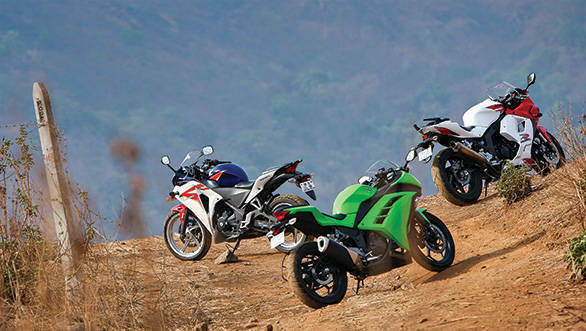 So we decided to look at all the faired 250cc-ish options available to you. 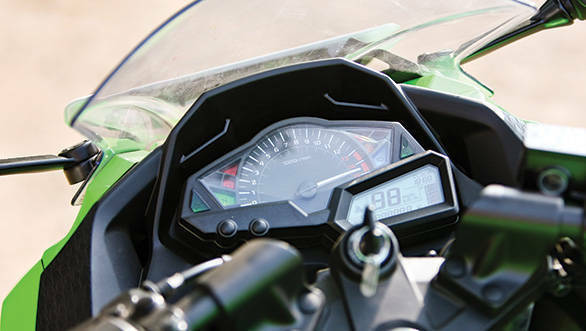 Spurring the test into existence is the Kawasaki Ninja 300 (N300 hereinafter), obviously. On paper, the all new Ninjalet is extremely promising. And this is only the second time in its entire history that the Ninja 250 has received a full-on ground up update. The price is a cause for concern, but we'll talk price right at the end. Does the CBR still make sense? How competitive is it? That is the question. And finally, we have the Hyosung GT250R. Which is a 250 and a V-twin. In price terms, it sits more or less where the N250R used to and on paper it should be more powerful than the Honda, slotting neatly between the CBR and N300. Does it manage to justify itself on to this middle path in the real world or not? Abhay, Vikrant and I rode the bikes head to head to find out. Unfortunately, the bike in third place is obvious. The Hyosung GT250R is a large motorcycle on its own, and very big in size by the standards of a 250cc motorcycle. This is a good thing if you would like to get noticed and that ego-boost side of premium motorcycling is important to you. Trundle through traffic and people will take note and turn to look. In the white and red paint, the bike draws eyes with incredible regularity. But the flip side is a combination of many things. First, the design isn't modern-looking. Modern motorcycles almost shrink-wrap their plastic fairing panels around the frame and the engine achieving a taut, sharp look. The Hyosung is anachronistic in this regard, employing a fairing that clears the engine by a surprisingly large margin and from the outside looking, er, fleshy. Like a gym-aholic who has stopped working out and surrendered to the charms of tandoori chicken and butter naans. What does not help is that on closer examination niggles pop out at you. The exhaust on our test bike looked terrible, panels gaps are huge - especially between the tank and frame - and the overall impression of both finish and build isn't positive. So the motorcycle which looks attractive from thirty feet away loses its charm as you get closer. The lasting impression is of a large motorcycle but not of a high-quality motorcycle. minor niggles that you don't expect from a Honda motorcycle. That said, this motorcycle is still light years ahead of the Hyosung and it's still only second here. And that should tell you how impressive the Kawasaki is. First, the new design is very fetching. I think the whole diminituvised sports bike design ethos is a great idea. It allows enthusiasts to ride a motorcycle that looks exactly like the bike of their dreams without dealing with the astronomical price tags. That is why the Yamaha YZF-R15 was such a success as a mini-R1, why the new faired KTMs due next year will be mini-RC8s and why the CBR is a mini-VFR. The ZX-6R/10R derived styling looks very smart on the N300 and eliminates all traces of the (in hindsight) slightly less fluent, less aggressive looking N250R. The twin head lamps looks fresh and slinky and all those flat panels and sharp edges define a very modern, fat-free design. The big vents on the side of the fairing, details like the floating visor and so forth all add to the impression of this being a well-built, extremely well finished motorcycle. In short, this is a no contest. Only thing I would add is that the white N300, in my opinion, looks way better than the green one and if I were buying one, that is the colour I'd pick. Would I buy one? Oh, you will just have to wait till the end of the test. The Honda CBR250R is the least powerful motorcycle here and the sole single-cylinder too. It uses a relatively simple DOHC, four-valve single cylinder engine to make 25PS and 22.9Nm. The nature of the performance is typical Honda, blending generous torque seamlessly into decent top-end punch to create a package that works well whether you like short shifting and surfing the torque or like to stay high up in the revs. But the Honda weights a full 21kg less than the Hyosung and this costs the Korean motorcycle dear. In our tests, the CBR250R hits 100kmph in 9.23s which is just over a second quicker than the GT250R. 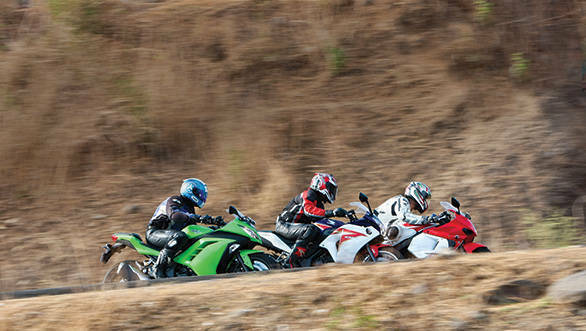 The Hyosung does have stronger roll-ons but flat-out, again, the Honda is marginally faster. But what really tips the game in the favour of the Honda is the refinement. The Honda engine isn't above buzzing your hands on sustained high speed highway runs but that one riding phase aside, this is a quiet, refined motor. One that makes highway work dramatically easy and our pick for the best long-distance motorcycle in India at the moment. The Hyosung disappoints on many counts. The performance issues aside, the motor is not very refined and it smoothens out only at about 90-100kmph which is good for highway work, but for a 28PS motorcycle that is a bit on the slow side cruising-wise. Despite the oil-cooled DOHC V-Twin, the Hyosung doesn't even sound great and as you raise the revs, the sound continues to remain unevocative. Add in a recalcitrant gearbox, inconsistent throttle response and all, and you have a motorcycle that is clearly more show than go. When the Kawasaki enters the picture, both motorcycle start to pale. The N250R was only marginally quicker than the CBR250R at street speeds. 60kmph would come up, for instance, only 0.3s earlier on the Kawasaki. But now the difference is much larger - 0.7s almost. This is because the redesigned 296cc engine is a very different creature from the old 250's engine. It not only uses the displacement to make 39PS (at 11,000rpm), but it makes 27Nm of peak torque at 10,000rpm without being lifeless at low revs. Serious acceleration comes from as little as 4500rpm and that makes this relatively small parallel twin shockingly flexible to use. The gearbox didn't like full bore shifts in the lower gears but that aside, the gears are spread wider apart than usual and they make great use of the new expanse of torque and power. And the numerical results are, as a direct consequence, very good. 100kmph takes just 7.2s. Roll on figures are excellent - 30-70kmph in third gear is just 4.93s - the Honda requires nearly 7.5s to the same thing. Top speed is over 175kmph, though we saw 162kmph (actual, not indicated) before running out of road. The beauty of the performance is that on the road, the N300 is nigh uncatcheable. Ride it swiftly and skillfully and neither the Hyosung nor the CBR can keep up. We also like the fact that this engine feels a lot easier to use than the N250R on the street and in traffic and the simple idea venting the heat from the radiator below the bike makes the motorcycle so much easier to ride. It's something the 200 Duke, for instance, could use. The only fly in the ointment is that at low revs, just like the N250R, the engine feels a bit tight before smoothening out at higher revs. When it comes to economy, the Hyosung is ahead. It returned 28.8kmpl in the city and 30.2 overall, which is marginaly ahead of the Honda which returns more than the Hyosung on the highway but at 29.3kmpl overall, trails the GT250R. The Ninja 300's bigger engine manages 24kmpl in the city and 30.5 on the highway giving it the lowest figure on test, an overall 25.6kmpl. 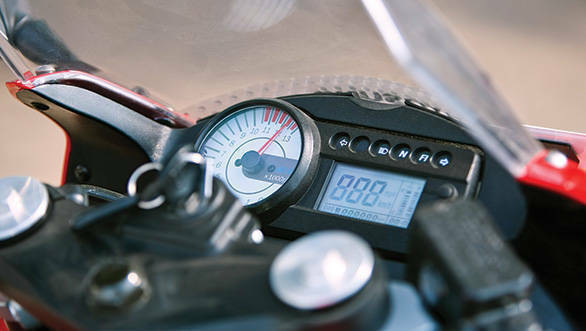 The 188kg of the Hyosung, once again, comes to the fore when it comes to the dynamics. And the ergonomics make the going very difficult indeed. The Hyosung matches a low and forward bar position to extremely rearset foot pegs and a high, canted forward seat. This kind of ergonomic setup was quite common in the mid-80s - just look up, for instance, the Yamaha FZR400 or the Ducati 916. 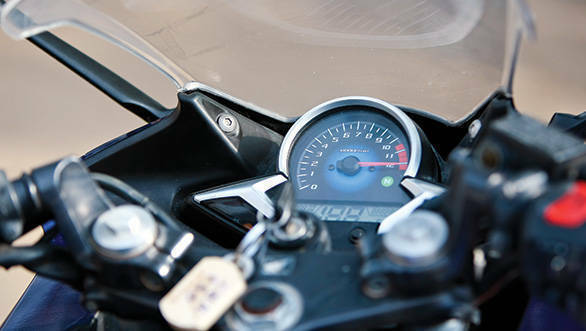 A powerful motorcycle, used on the racetrack will find these extremely committed rider positions to advantage but in daily use, this setup is painful. And that is the case with the Hyosung. You get stuck in one riding position between the fat tank and the bar-peg-seat situation and it isn't the best way to sit on the motorcycle. The result is that it is a difficult motorcycle to get along with physically. It also steers into corners at a leisurely rate and despite its weight and length, you never quite gain full confidence when leaned over. Cornering then, is hard work. On the other hand, ride quality is a surprise. The GT250R goes over big and intermediate bumps rather well, absorbing most of the punishment with almost un-sportsbike like damping. But small bumps are felt sharply and I suspect this is one of the reasons why you never gain mid-corner confidence because small bumps upset this bike more than others. On the braking front again, performance is middling. The feel from the lever is inconsistent, overall brake force is just about adequate and like the cornering, braking to a full stop is also hard work. Swapping to the Honda CBR250R is, then, almost like night and day. The Honda, despite a brilliantly neutral chassis is suspended softly - perhaps out of consideration for our roads. What this means is that the chassis is always confident and this is one of the reasons the Honda is such a great highway machine. Ride quality is also very slick and bump absorption in all situations is excellent. But when you up the pace and head to the racetrack, as we have established reto peatedly, the Honda starts to pogo on its suspension and becomes unwieldy. I believe just stiffening up the suspension would do wonders for the CBR250R's handling and my example is the CBR150R which needs more power but the chassis composure and handling is superlative. On the brakes, the Honda feels very friendly and sharp and the ABS system also works really well. That said, dive on the brakes is pronounced, a direct result of the softer setup. The Ninja 300, once more, steals the show. It is such an easy motorcycle to ride quickly that most of the time you don't realise how little effort you are actually putting in to go faster. The IRC tyres have been maligned by many international road tests and the fact is that the chassis does have more ability than the tyres can handle. But most of us aren't skilled enough to ride at that pace. Moreover that pace is best experienced at a racetrack not on the street. From the deft, alert turn-in to the mid-corner stability and the ability to hook up and drive rapidly out of the corner, the Ninja 300 is an able dance partner. It is also the easiest motorcycle in side-to-side transitions here which makes riding it a lot of fun. Some words of warning though. The Ninja 300 is so effortless that it takes time before you wake up to just how well-developed its abilities are. This makes the initial part of the ride a bit boring because everything seems to happen without really requiring you to be involved. It's only a few hours in that the Ninja 300 begins to make a place for itself in your heart. And then your impression transforms dramatically from "What a nice motorcycle" to "Amazing!" The other thing that struck us was that the Ninja 300's ergonomics package is a bit odd. It isn't committed like the GT, nor is it upright and all-day comfy like the CBR, it is somewhere in the middle. Just middle enough to feel odd. Also, if you carry a heavy backpack, the Ninja 300 (and surprisingly not the CBR) will cause a backache. 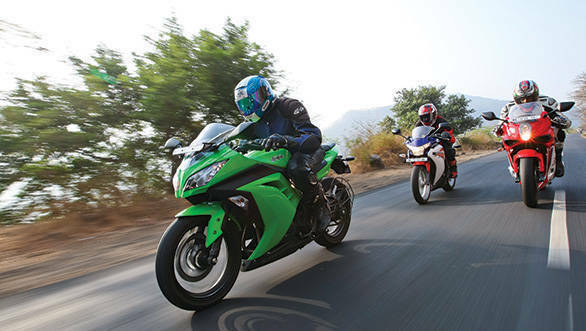 The Ninja 250R was a demon on the brakes and the new one betters it. Our 100kmph to standstill was a shockingly short 36m without ABS while the other two motorcycles took almost twice the distance. We still believe the N300 ABS should be offered for sale in India but as it stands, these are good brakes. Feel is excellent and power comes on progressively allowing newer riders to use the brakes without fear. The Hyosung GT250R no matter what we say is a successful seller for DSK Hyosung. This is very clever marketing because the company has opened up showrooms in smaller towns where the bigger brands will take time to arrive. But unfortunately, the GT250R requires a lot of development before it can match the Japanese competition move for move and before the cognoscenti accept it as viable enthusiast motorcycle. You could buy one for its size and appeal but it isn't inexpensive either at Rs 3.34 lakh on-road Mumbai. DSK did announce a plan to locally assemble the GT250R at a later date and should that happen, the price would halve. But all told, there are far better ways to spend Rs 3 lakh. The Honda CBR250R is a clever motorcycle. It does 99 per cent of what you would do with a motorcycle this size (both physically and in displacement terms) astonishingly well. It has two weaknesses, the small one is the overall finish and the other is its suspension's inability to handle full pace - though only at track speeds. The latter is an issue, obviously, only if you are a track day regular. Everyone else, we believe, will find the CBR absolutely wonderful to ride around town, up the hills and down the highway. Hell, it's economy drops sharply past about 115-120kmph but despite that, this is India's best highway motorcycle. At Rs 1.73 lakh on-road Mumbai, the Honda is also the cheapest motorcycle in the test and it is, shockingly less than half the price of the Ninja 300 which is sure to give the N300 buyers pause. Best value for money proposition here? By miles. That brings us to the Kawasaki Ninja 300. Team Green have really upped the game. The N300 is vastly better than the N250R in every single department and in this test, is vastly superior in every aspect to the competition. I have no doubt that when I finally take it to the racetrack, it will demolish most of the competition if not all as well. But the disappointment was writ large on the faces of all the motojournos at the launch of the motorcycle itself. The Ninja 300 costs Rs 3.94 lakh on-road Mumbai and that is a steep price, especially given that Rs 3.34 lakh used to be the price of the N250R. Is it a great motorcycle? Undoubtedly. And if the budget isn't an issue for you, there is no reason to think twice. Head on over to the KTM showroom and put the money down on one. Would I buy one? Honestly, I think the motorcycle is too expensive. And neither would I settle for the Honda CBR250R. Because an extremely promising alternative is headed your way very, very shortly. That's the other problem with choice. In a growing, still maturing market like ours, the number of choices is never finite. Now how do you handle that?